As a child, loneliness dogged Julia Ludlow like an unwanted shadow. She’d inherited the depression and anxiety that had marked her grandparents’ and parents’ lives, and she could never figure out how to reach out to other children. Afraid of meeting new people, she’d hide behind her parents’ legs. When she was 12, her one and only friend moved away and Ludlow struggled with a renewed sense of isolation. She felt like garbage and couldn’t articulate why. She wasn’t doing poorly at school—she had A and B grades. Yet when she rode on the school bus, she’d shelter from its social chaos behind headphones; at night, she’d remain hermit-like in her bedroom, crying in confusion at not knowing how to think or how to feel. It wasn’t until seventh grade that Ludlow made a new friend, Harli Holmes, in Spanish class. Holmes would poke Ludlow in the side, opening up her world with light-hearted ways and movie-obsessed chatter. After feeling invisible for so long, someone finally saw Ludlow. The friendship couldn’t have come at a more crucial moment. She took an Altoid mint tin and filled it with Tylenol pills. (Acetaminophen, a key ingredient in the pain pill, can prove deadly if too much is taken; in excess, it can severely damage the liver). Ludlow had her own spot at school, an alcove where she could sit and not talk to anyone. She got a glass of water at the cafeteria, took six pills, then realized she’d need more water. “Crap,” she thought. As she hurried to the cafeteria, she fixed her eyes on the floor, hoping to get back to the alcove without being stopped. It was then that she ran into Holmes. Her friend babbled on until Ludlow suddenly burst into tears. “Are you O.K. ?” Holmes asked. She’d known Ludlow had had some problems but thought she was coping better. In between sobs, Ludlow told Holmes her plan and showed her the Altoid tin. Although her suicide attempt had taken just a few seconds, to Ludlow it felt like a lifetime. Holmes put her arms around her. Then she took Ludlow to the school counselor, something they’d been taught in classes as part of the student response team—effectively the eyes and ears of school staff when it came to struggling students. Ludlow’s devastated parents watched her fill out a mental evaluation form at the counselor’s request. ”When I checked the box that said I wanted to kill myself, the fear on my parents’ faces was something I’ve never seen before,” Ludlow says. Julia Ludlow at her favorite childhood park near her northern Utah home. Photo: Jen Pilgreen. At the time Ludlow tried to end her life, Utah was experiencing a climbing wave of student suicides. In 1999, Utah’s rate of suicides among youth ages 10 to 17 was 3.8 per 100,000, slightly above the national average of 3.1. By 2015, the national rate had climbed to 4.2, while Utah shot up to a horrifying 11.1. Between 2011 and 2015, 150 mostly white, male Utah teens killed themselves. What’s driving the crisis, argues Utah State Senator Daniel Thatcher (R-Tooele), is fear. “The reason we’re seeing such an epidemic right now is we’ve neglected this issue for so long because people are afraid to talk about it,” Thatcher says. One response to this crisis was the state’s January 2016 launch of SafeUT, a student safety reporting mobile phone app. The unique online tool, which offers immediate help via text chats and phone calls from licensed UNI counselors for students in crisis and those concerned about them, has pulled back the curtain on the dire level of need for increased mental health resources in Utah. That’s apparent in the never-ending rise in demand for its services: in 2016, there were 3,924 tips and chats with troubled students regarding school safety and mental health issues; by fiscal year 2018, that had skyrocketed to 30,474. K-12 and higher education utilization of SafeUT app from July 2017 to October 2018. Credit: University of Utah. Indeed, SafeUT affords an often-painful insight into the mental health challenges facing children and adults. Suicide, says Jose, a SafeUT licensed clinical therapist, “is a response to pain: emotional, physical, mental, spiritual. It comes after sitting with that pain too long without a healthy outlet.” Fellow SafeUT operator and licensed clinical social worker Kathy clarifies, “It’s not usually about wanting to end life but wanting to end the emotional pain they are in.” (Therapists’ names have been replaced by pseudonyms due to security concerns.) 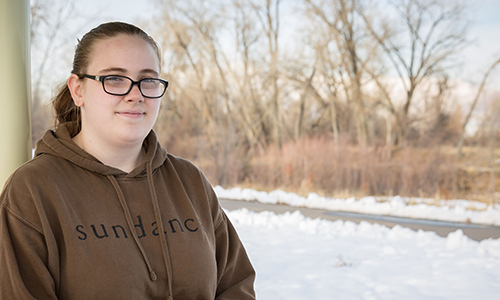 Ludlow believes that programs like the student response team and SafeUT save lives, since they teach kids like her friend Holmes to reach out to adults for help in the face of such crises. Operated out of a UNI call center in Salt Lake City, the app also tracks tips on possible threats of violence at school. 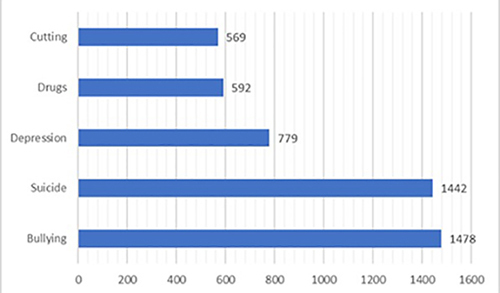 Guns, knives, explosives, and planned school attacks all make up part of the 286 unique potential school threats UNI received from 448 verified tips in 2018. The busiest time on the SafeUT app is between 7 p.m. and midnight. That’s because kids are out of school, have had dinner with their family, and are in their room, a private space where they feel safe, therapists say. One November afternoon in the call center, men and women with headsets on juggle multiple online text chats. There’s an adult struggling with a life crisis involving a child, several students battling depression and feelings of worthlessness, and one student seeking help for a friend who is self-harming. 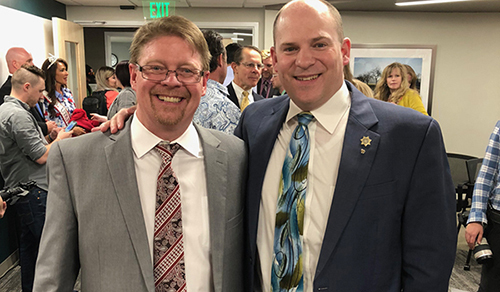 SafeUT is about unsung “heroes,” says Thatcher, who along with Rep. Steve Eliason (R-Sandy) is its political champion in the Utah legislature. But for all the efforts of politicians, law enforcement, anti-bullying and suicide advocates, educators, and community members to get the app up and running, it’s UNI’s therapists that bear the emotional and psychological brunt of the daily cries for help. They are charged with accurately assessing the threat level of self-harm or violence, then—if necessary—organizing what’s called an “active rescue.” Because the app is both anonymous and confidential, they also have to live with the haunting burden of rarely knowing the fate of those who reach out to them. Such anonymity is key to SafeUT’s effectiveness, in part because some students are scared of being labelled as “narcing” on friends or being perceived by peers as having mental health needs. SafeUT leadership (left-right) Barry Rose, Juliana Briscoe, Ross Van Vranken. Photo credit: Jen Pilgreen. In 2013, Sen. Thatcher’s friend at the Utah Attorney General’s office, Wade Farraway, showed Thatcher data that revealed “suicide was the leading cause of death for kids in Utah,” he recalls. Farraway was one of the first advocates for school safety crisis response in Utah, inspired in part by the Safe2Tell program developed by Colorado after the Columbine school shooting. Farraway and Thatcher’s initial conversation led to newly appointed Attorney General Sean Reyes picking up the cause and appointing Missy Larsen to work with Sen. Thatcher on proposing legislation that eventually resulted in a commission charged with looking for answers to the crisis. From that commission emerged the idea of student crisis and safety support through an app. A company out of Texas agreed to provide the software for free—at least for the first few years—to Utah. From the very beginning, the discussion included crisis support for teen suicide risk and school threats. It was clear that therapists rather than law enforcement should respond to those in need. Commission members approached UNI and asked “if we would manage the clinical operations behind the system,” says UNI business operations director Juliana Briscoe. In the 2015 legislative session, Thatcher “put personal asks on the line,” Larsen recalls. Together with Rep. Eliason, they successfully pushed through legislation that secured an ongoing appropriation of $150,000, along with a one-time addition of $150,000, to install text response technology that could be used with the free app and employ additional therapists. 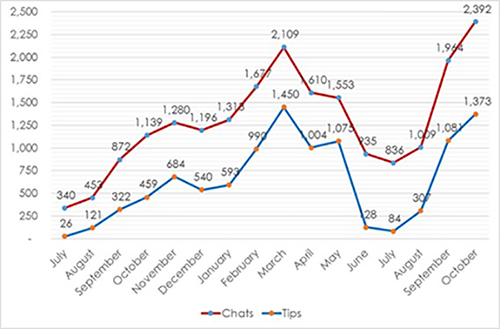 Most frequent topics K-12 texters sought help on from SafeUT therapists between July 2017 to October 2018. Credit: UNI. The challenge, however, lay in accurately assessing the ebb and flow of demand for on-duty therapists. “What’s tricky is that the dollars don’t support staffing,” Van Vranken says. “And you can’t have a crisis app if the funding doesn’t provide enough for adequate staffing to handle the text volume.” Along with implications for UNI’s budgets, there were also concerns about how to approach enrolling schools that agreed to promote the app to their student bodies. 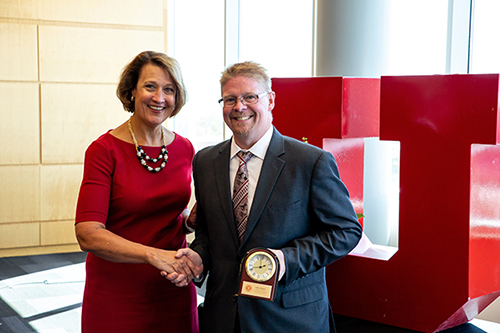 Eliason, by then employed at University of Utah Health, approached chief executive officer Gordon Crabtree about the university bankrolling the development of a new SafeUT app. In May 2016, Rose emailed U of U Health IT department manager John DeGrey. After learning about the project, DeGrey, who had just applied for a MBA program in part to train himself up for his new managerial role, took on the challenge of developing the app. Initially, DeGrey managed to juggle his first year of MBA school work and the long hours he put into the project. Increasingly, though, the app became an obsession for him, and he would commit 100 hours a week just in development time. By June 2017, something had to give. He was working till 4 a.m. on the app, getting up at 7 a.m. to go to work and then school. His family never saw him and his wife wanted him to throttle back on the app and continue with school. They’d just spent $20,000 on the first semester and sacrificed both international trips and family vacations to the app. But dropping out of school would allow him to finish the app and ensure there was a smooth transition from the original software to the new app at the beginning of July 2017, with the threat of financial penalties if that deadline was missed. University of Utah president Ruth V. Watkins and IT manager John DeGrey. Credit: University of Utah. DeGrey wasn’t the only one struggling to cope with the app. UNI also had issues. Demand for the app in the 2017-2018 school year outstripped the $550,000 the legislature put aside in ongoing funding, leaving U of U Health to cover the additional $235,900. The price, though, for failing to catch that teenager who’s decided to die—of missing those sometimes too deeply hidden nuances of despair and turmoil in their texts, their words, and their gestures—is unbearable. On Sept. 10, 2017, 15-year-old Joey Thomsen sent his mother a text. Genna Thomsen thought her handsome, gregarious son was trying to wrangle a fast-food run in their hometown of Tooele. He was a healthy, straight-A student, loved by all, with so much to look forward to in life. “He by all accounts had a good life,” she wrote in a widely publicized email. “And still he made a choice to end it. I can't get my heart or head around it. Maybe I never will." Rather than asking her for a ride to McDonalds, Joey Thomsen’s motivation was farewell. Fifteen minutes after he hit send, he took his own life. Over SafeUT’s first two years, the greatest challenge its therapists have faced is the opacity of text language. Words only make up 7 percent of what Albert Mehrabian called “the elements of communication” (body language makes up 55 percent). And with text as the only form of communication, there’s no tone, voice, or body language—it’s just words on the flickering screen. Does that mean suicide or self-harm? Is the texter expressing reluctance to take their own life or is “wont” a typo and they mean “want”? (It turned out to be the latter). Text exchanges can often be frustratingly brief and obscure. “Why do you want to die?” the counselor asks. Achieving clarity in the face of such vagueness can make rescuing someone that much more difficult. Along with their years of experience and training in dealing with people in crisis, the clinicians have found that Google can be their new best friend when it comes to understanding texting’s ever-evolving language. “A big part of what therapists do in general is we reflect,” Jose says. When a 12-year-old is using emojis, he’s going to use them back. The SafeUT app being used by a texter. Photo credit: Charlie Ehlert. At 2 a.m., SafeUT therapist Liz had an “encounter” and was notified online. That meant someone had texted the SafeUT app in search of help. Liz had no idea who the person was and no way to locate the texter without his or her help. All she had was words to try to get to the truth. The texter kept her up to date with her consumption of liquor and pills, even as the error-riddled typing indicated the writer’s growing impairment. She informed neighboring staff she had an ongoing “active rescue” so they could take over her chats and also help her locate the woman, either by calling police or paramedics to request a welfare check—assuming she could identify her. Liz made little headway with identifying the woman. After asking the woman for her phone number several times, Liz’s efforts finally paid off and the woman provided her number. Liz followed active rescue procedures to help paramedics get to the texter as fast as they could. Then Liz called her on the phone. She stayed on the line with her while they waited for help. Forty-five minutes later, the ambulance’s sirens wailed in the distance. By then, the texter was unresponsive. As Liz put down the phone, her methodical calm seeped away with her adrenaline. All she was left with was the gnawing uncertainty about the woman’s fate and the after-effects of the stress her body had gone through. She felt like she’d been run over by a truck. Harli Holmes and Julia Ludlow. Credit: Jen Pilgreen. Banner image of Julia Ludlow and Harli Holmes. Credit: JenPilgreen. If you or someone you love is struggling, the National Suicide Prevention Lifeline (1-800-273-8255), provides free 24/7 crisis response assistance to individuals experiencing emotional distress or psychiatric crisis. 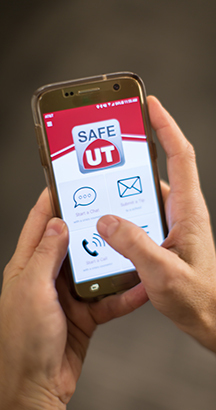 If you are a current Utah student, educator or parent, please download the SafeUT app today. Both services are staffed by University of Utah Health licensed crisis clinicians.